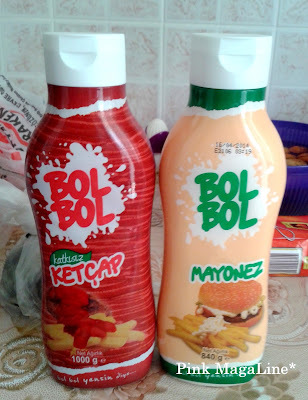 I posted this photo of Turkish ketchup and mayonnaise in IG sometime in May and received funny comments about it. The brand name is Bol bol which is kind of odd when translated in Tagalog. In Turkish, bol bol means plenty, but in Tagalog, it means (excuse me if you're reading this while having a meal).. genital hair. While in Akçay one day, I thought about cooking spaghetti and making a sandwich for my picky eater so I requested my my mother-in-law to buy for me. When she came back from BIM, a local mini mart, I saw these big containers of her favorite brand of ketchup and mayonnaise, or respectively, ketçap and mayonez in Turkish. I know I've seen this brand two years ago on our first visit in Istanbul. I just didn't really mind it. Anyway, I was smiling all the way through the preparation of my daughter's food, thinking of how funny it could be if Bol bol exists in PH. She noticed my facial expression and she was like, "Why are you smiling Mama?" I said, "Nothing really dear. I just find the name of ketchup and mayonnaise funny," then told her to eat her meal. I even jokingly added not to worry because they are clean and there's no way that she'll see a strand of hair in them. Haha! it has the same translation for bisaya pala.. I was smiling while I was reading this post. Wahaha I think only Filipinos would understand what the word means. Others will not think it's funny at all. Haha. This would really be funny. I once saw ginger ale as well in a mall grocery before (I forgot if it was a Turkish brand too) and the name was Chimay Ale. My sister just had to snap a photo and instagram it too. If they plan on selling that here, they better change the name. I doubt if anyone would endorse a product named such, even if it was really good. Or maybe, they can keep the name and have Kris Aquino endorse it. Lol. Oh I don't think it won't sell that much here. I can already imagine the jokes that fellow Filipinos would impose upon these items. Haha! Hahahahaha....I do understand why is it funny...hahahaha..I am from Davao and I know what is the meaning of that. Well nevertheless, I think it taste good just don't mind the name. hahahahaha.. I never heard this before :) Anyway, BIM Markets are favorite of many people living in this country. So i was in BIM 1 hour ago :) This mayonnaise 4.95 TL (approximately $1.5) and very cheaper and taste from Calve. My other favourite market is A101. Low price and high quality all the time.